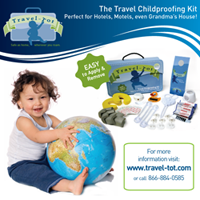 Travel-Tot: Products We Love: Aero-Tray - Revolutionize Your Space! Products We Love: Aero-Tray - Revolutionize Your Space! Looking for the perfect solution to creating a comfortable work space while traveling? We've found it! Aero-Tray is a revolutionary travel accessory, that is perfect for the whole family! A portable, ergonomic work area for laptops, mobile devices, books, magazines and more, Aero-Tray can be used on planes, trains, automobiles, in bed, on your lap - you name it. Aero-Tray creates ample room for tech gear, food and beverage, and entertainment materials to be used in a comfortable manner in even the tightest of spaces. But don't just take our word for it - check out this video and see how Areo-Tray revolutionizes your space! Aero-Tray is available through TravelSmith.com and is offered in two colors; Noir and Camel (retails for $59.95 USD). For more information, check out http://www.Aero-Tray.com! A Travel App That City Slickers Will Love! Tips and Tricks for Packing Your Car! Blogs We Love: Traveling Families! Lions and Rhinos and Leopards, Oh My!